If you're brand new to quilling, just a few inexpensive supplies are needed - a rolling tool, paper strips, and glue. Keep in mind my first tool was a cake tester from my kitchen drawer... in other words, any slim, stiff wire will do. Cut a sheet of copy paper into narrow strips to use for practice. If you decide to purchase a tool, there are two types - needle or slotted. The slotted tool is easiest to use; its only disadvantage is that the slot leaves a crimp in the center of a coil. If this bothers you, try an ultra-fine slotted tool or a needle tool. People usually find the needle tool is more difficult to master, but the reward is a perfectly round coil sans crimp. Quilling paper - gold-edge black, 1/8 inch (standard width) - J.J. Quilling Design in England produces it; a few U.S. online suppliers carry it - Custom Quilling by Denise, Quilling Supply, and Whimsiquills. It isn't expensive (only looks that way!) and comes in a package of thirty strips. You'll be able to make about six birds/package. Roll a coil with a slotted tool: Slide strip end into the slot and turn tool with one hand while guiding strip with the other hand. 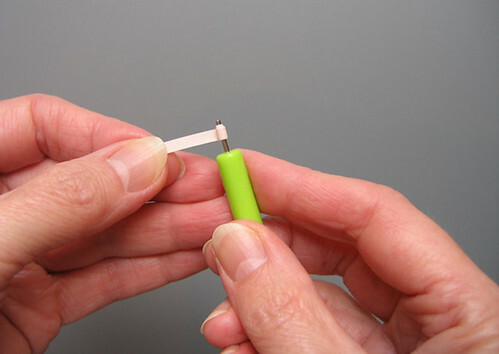 Roll a coil with a needle tool: Dampen fingertips and roll strip around needle with the thumb and index finger of one hand while holding handle with the other hand. Be sure to roll the paper, not the tool, and apply firm, even pressure. Whether using a slotted tool or needle tool, when the strip is fully rolled, allow coil to relax and slide it off the tool. This is called a loose coil, the basic coil from which many other shapes are made. 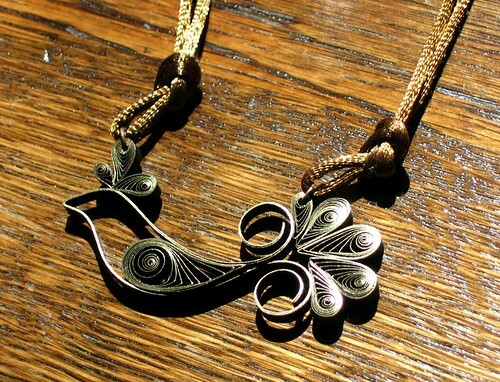 For the bird pendant, you'll be making teardrop and shaped teardrop coils. 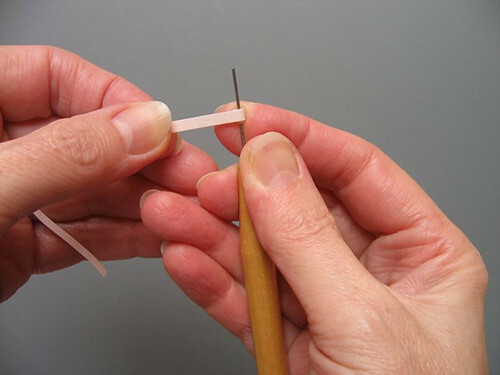 Make a teardrop:Roll strip, slide it off the tool, and pinch to a sharp point. 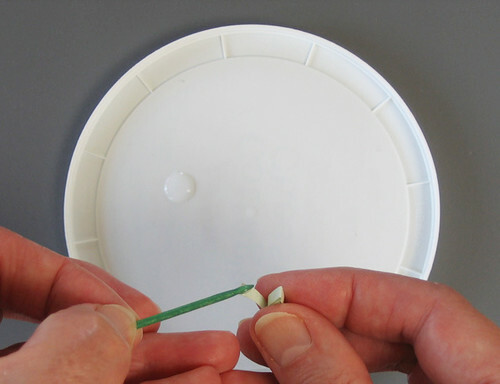 Use only a tiny amount of glue on the strip end, applying it with a toothpick, pin, or tip of a paper piercing tool. Hold in place for a few moments while the glue dries. Make a shaped teardrop: Use fingers to curve the tip of a teardrop coil. Now that you've learned the basics, you're ready to roll! Step 1: Glue three 7 inch strips of gold-edge quilling paper, one on top of the next. If the stack gets sticky, wipe it with a damp cloth before the glue sets. When the glue is completely dry (a few hours or even overnight; otherwise the paper will buckle) fold the strip in half and shape the bird outline. 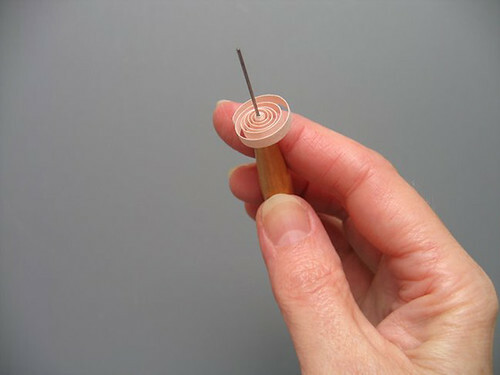 Curl the ends away from one another around the handle of a paper piercing tool or quilling tool. Apply a small amount of glue where the top and bottom of the outline touch. Step 4: Make an 18 inch shaped teardrop coil. Glue it inside the body outline as pictured. Step 5: Turn pendant over and reinforce all of the joins by applying a dot of glue wherever coils meet. Allow glue to dry before going on to the next step. Step 6: Attach a jump ring to the largest head feather and a tail feather as pictured. 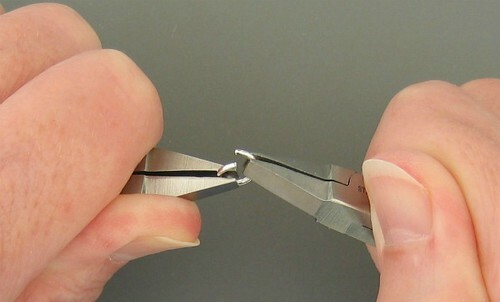 To open the jump ring, grasp each side of the ring split with pliers. With a gentle twisting motion, push one side away from you while holding the other side steady. Slip ring through coil and reverse motion to close. Step 7: Cut cording in half, thread one piece through a jump ring and tie a single knot close to the bird. Repeat with the opposite jump ring. 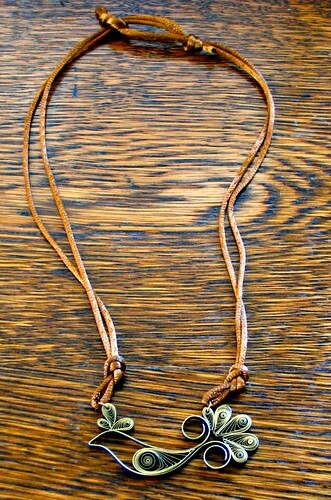 Finish off with an adjustable sliding knot so the necklace can be slipped on and off over your head. I used the sliding knot instructions found here. If you prefer, a length of necklace chain can be attached to each jump ring. Fasten with a clasp. There - something new to wear tomorrow! And here's a new variation, my Bluebird of Happiness... why I made it. A little fyi... Quilling has been around for ages... centuries actually, and has changed very little over time except for all of the specialty papers that are available... graduated colors, two tone, pearlized, and even silver, copper or gold-edge like the kind used to make this bird. Not only is the metallic edging beautiful, but it lends extra strength. I have to say though, rolled paper is surprisingly sturdy on its own with or without a metallic edge, making it especially suitable for pendants or earrings. If you don't have access to metallic edge paper, you can run a gold leafing pen along the edge of plain black quilling paper before rolling it or press the finished bird in a metallic ink pad, such as Galaxy Gold by Brilliance. 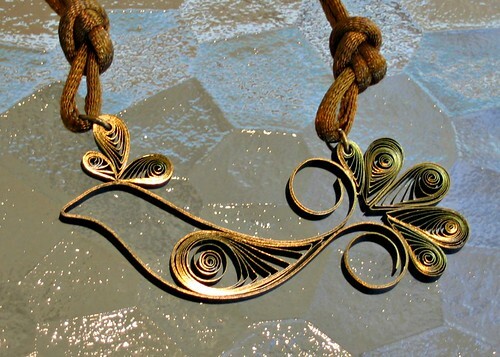 You'll find many more quilled designs in my book, The Art of Quilling Paper Jewelry. Hi Kim, thanks. :) It's funny; I'm very neat about some things, but definitely not all! It looks perfect and very beautiful ! Thanks a lot for sharing step by step ! I remember this one , it's beautiful, did you use a sealer for it ? I remember this one, its beautiful, did you use a sealer? Hi Paula, I didn't use a sealer. It's quite sturdy as is. I usually apply extra dots of glue on the back of a pendant wherever the coils touch - this gives extra strength. This is so beautiful!! thank you for the tutorial. I don't think I've seen this necklace before but it is really pretty. thanks for the tutorial. I've been in love with this bird for a while and appreciate the tutorial. I am also really curious about sealers for gilded papers - a couple I used in the past reduced the metallic sheen. Hi Zoe, thanks. I've not had good luck with sealers either. Pendants usually stay out of the way when worn, unlike a bracelet or ring, so I don't worry about using a protectant. As long as I'm not drenched in a storm, they're fine. That's a beauty--thanks for sharing! 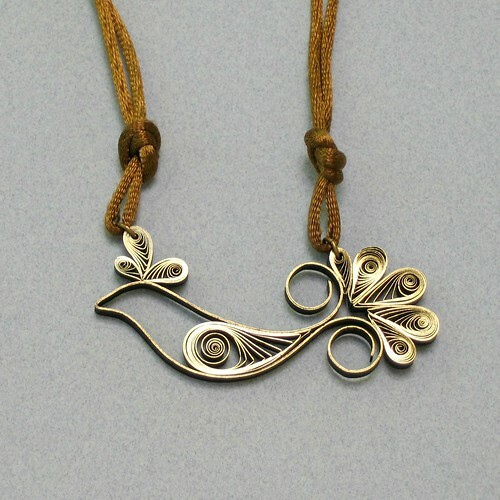 So nice of you to share the tutorial for your bird pendant Ann. thanks for answering about the sealant too. Sealers sometimes seem to give a stony look to the quilled jewellery. 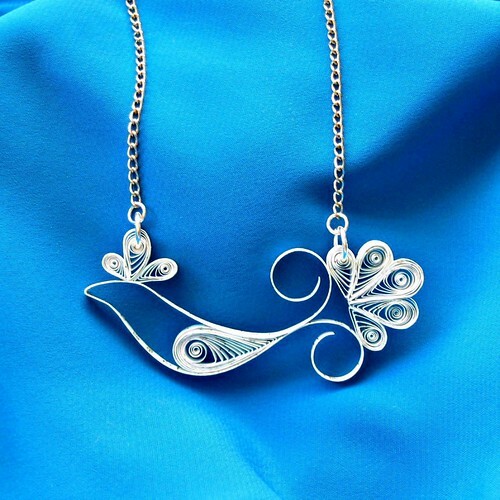 Ann, it's no wonder that you always receive compliments on this beautiful necklace! How generous of you to share how to do it. Thank you so much! I'm sharing this!!!! Just beautiful, Ann! I want to try this. Utterly fabulous! I am sure you receive many, many compliments when you wear this! Thanks everyone! I hope you'll give it a try. So lovely!! This is the first I have seen it and I am very inspired to try it. Thanks, I hope you will give it a try! How beautiful!!! Truly artistic and makes me want to try a craft that I have never considered before seeing this. Thank you for sharing this! Hi. do you know some product to brush over the quiling and do it water resistand and give more hardness? Thanks. I don't generally use a fixative, but have heard that Liquitex Gel Medium works well. I would recommend a matte finish rather than glossy so the paper still looks like paper (instead of plastic) when it dries. Thanks Linda, I hope you will! Its very beautiful and elegant... I will want to try this ... :) I will definately let you know it came out.. it would be wonderful if you can help me improve as I am very new to quilling... :):) thanks a lot.. I'm glad you like the bird, Priya! If you have questions about it, let me know - I'm happy to help. What are you doing this truly extraordinary, in my country Indonesia has never been a craft of this kind, I am really impressed with your work ... Thanks. Another awesome tutorial from you! Thanks so much Ann for sharing. This bird is so very classy. I will try it in the near future. Thanks Charlotte, I'm glad you like it. Would love to see your bird when you get it done! My email addy is on my About page. Ann, the necklace is Beautiful! I am a metal clay instructor, and have your book to start quilling. I'm anxiously waiting for your jewelry quilling book to come out, and had some questions about wearing paper quilled jewelry. Do you spray it with a sealer to protect it? I've already made earrings with silver clay sheet, but I want to make some with metallic paper, and for practice. I live in south Florida and I am concerned with the glue falling apart. Thanks for the books, and tutorials. Hi Bernadette, thank you for your message! How nice to hear you have Creative Paper Quilling and are looking forward to my new book. I generally don't spray quilled jewelry as I find dotting a bit of extra glue on each reverse side join is enough to hold it securely, but a fixative can be applied, especially since you live in a humid area. A light coating of Liquitex Matte Varnish on the back of a finished piece works well. 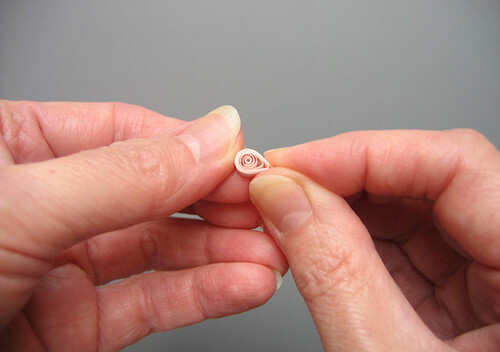 Applying it to the front of jewelry made with metallic edge quilling paper can dull the shine.